If you live in Colorado, you already know that our weather is very unpredictable. But couples who ask me about the best month to elope in Colorado are always surprised that the weather and seasons are so erratic here. So if you’ve ever wondered what’s the best month to elope in Colorado, here’s a full breakdown for you! January and February are very much traditional winter months in Colorado … in the mountains. Down in the Denver/Boulder area, we have everything from 70 degrees and sunny to heavy blizzards. Daylight hours are short (7:30am-5pm ish), so if you want a sunrise elopement without getting up too early, winter is the time to go. Most hiking trails, including everything in Rocky Mountain National Park, is much more quiet this time of year too. 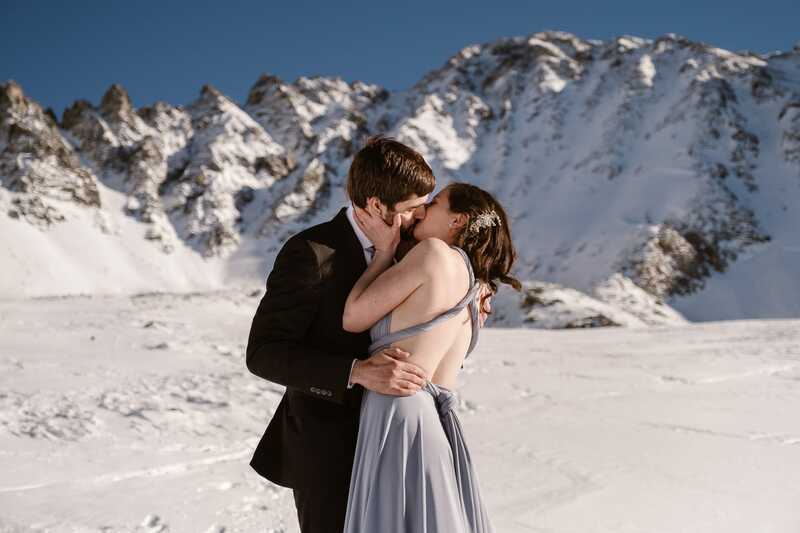 If having a frozen alpine lake to yourselves sounds like a good time for you, eloping in winter is the way to go! Christine and Jordan’s backcountry skiing elopement might just be the most Colorado thing I’ve ever photographed! I’m listing March as separate from the other winter months because it’s the snowiest month in Colorado. We get a lot of blizzards this time of year, and this unfortunately can make elopements hard to plan. This year we had over 500 avalanches in March! Many roads through the mountains were shut down, and more than one avalanche went across roads and caught cars. The photographer groups on Facebook were full of posts from people who couldn’t get to shoots and weddings because of closed roads. If you really want to elope in Colorado in March, I highly recommend picking a location like Rocky Mountain National Park or Boulder / the foothills rather than going up into the mountains. K & C’s winter elopement in RMNP shows the full range of winter weather over three hours in three locations! April is spring across most of the United States, but Colorado is a bit extra. There are absolutely no guarantees for what weather you will get for an April elopement; it could dump a foot of fresh snow in 24 hours, or you could get a warm and sunny day. Anything at high altitude will still have snow, while the lower areas can be buddy and gray. On the bright side, it’s generally warmer than the other snowy months, so if you want to rock a wedding dress in the snow, April might be right for you! 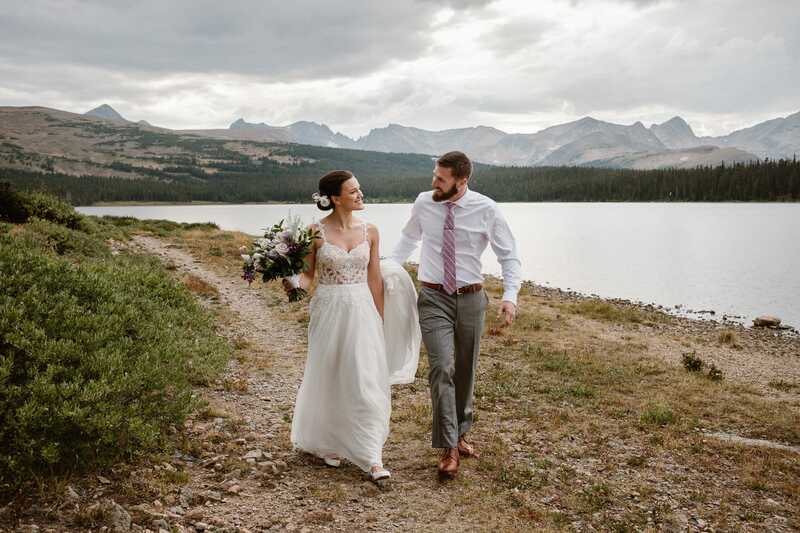 Check out Caroline and Steve’s elopement at Sprague Lake in RMNP – we had to move up the ceremony to earlier in the day to avoid heavy rain in the afternoon! May means it’s finally spring in Colorado! The grass is slowly getting green again after months of rocking the brown/dead look, the trees are coming to life … and surprise snow storms are almost a weekly occurrence. Yep, we’re not done with the snow yet. At high altitudes, the snow is starting to melt, but there are still a couple of ski resorts open, and most mountain passes and high trailheads are closed. 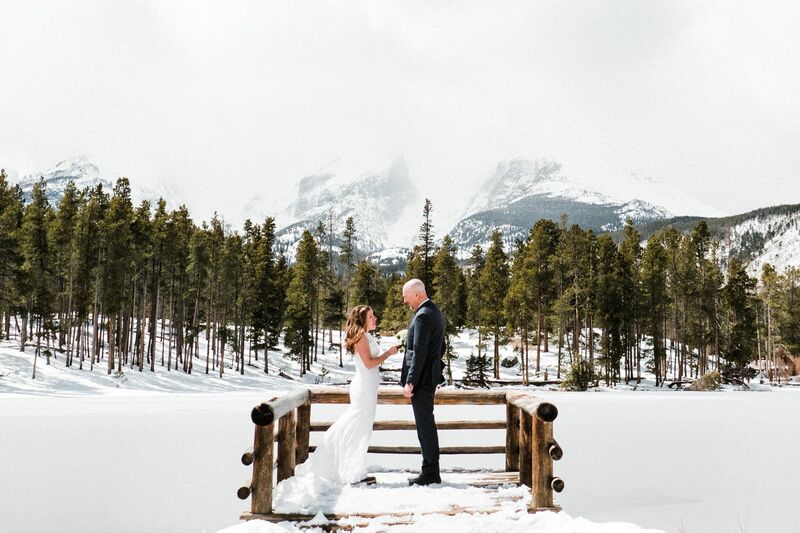 It’s a great month for Rocky Mountain National Park elopements, since the park is less busy than during school holidays, but still warmer than in the winter months. 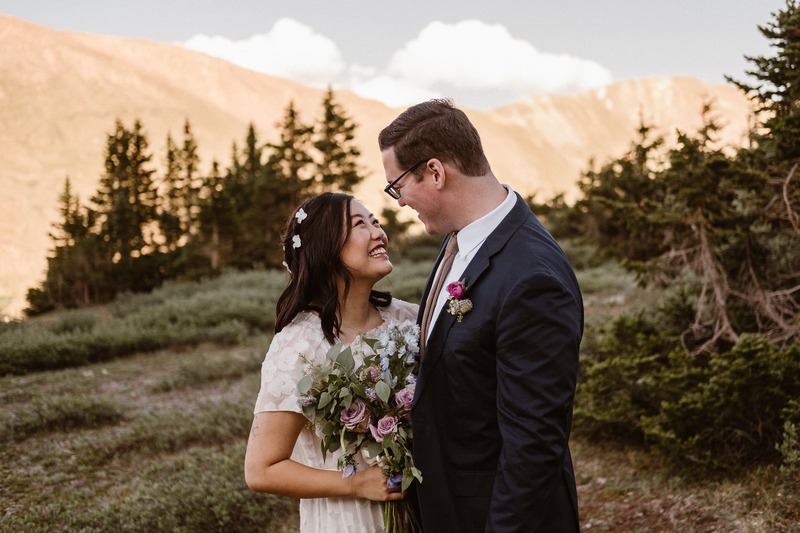 Check out Shawna and Peter’s vow renewal that got snow on May 1st, and Alyssa and Matt’s elopement at Maroon Bells at the end of May. I can only speak for myself, but June is by far my busiest month as a Colorado elopement photographer! Everything is green, the weather is pleasant without being too hot … and there’s still snow at high altitudes. Many of the mountain pass roads open throughout June, so you have more locations to choose from than earlier in the year, but not everything is open yet. June is also when wildflowers start peeking out. And rivers and waterfalls are at their fullest from all the snowmelt. 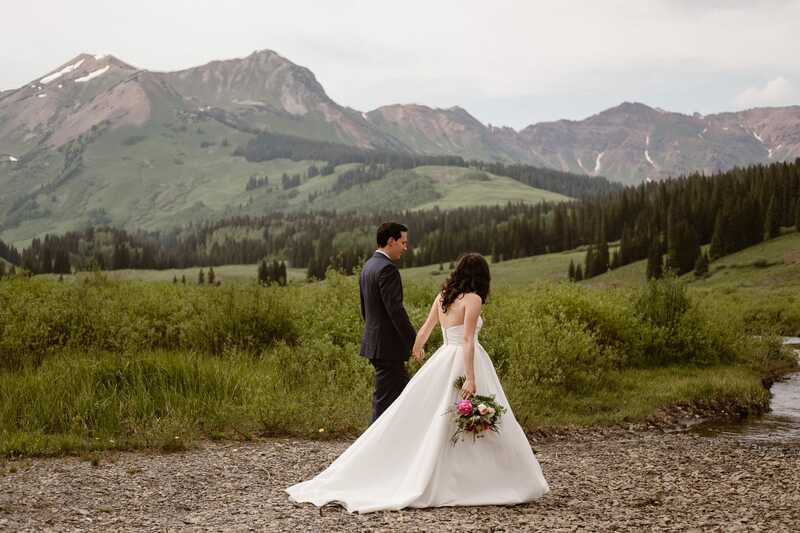 Check out Holly and Matt’s June elopement in Crested Butte, at the very beginning of wildflower season, and Sae and Andrew’s high mountain elopement at a lake that’s covered under snow for more than half the year! July and August are actually my favorite months to elope in Colorado! I think many couples avoid these months because they’re worried about being too hot, but at 10,000ft and higher it’s the perfect temperature. All the mountain passes are open by now, so you have way more locations to choose from. (Seriously, I have so many epic locations saved for couples who want to elope in July or August that aren’t accessible the rest of the year!) July is also the height of wildflower season, and perfect for escaping to a mountain town like Crested Butte or Telluride. 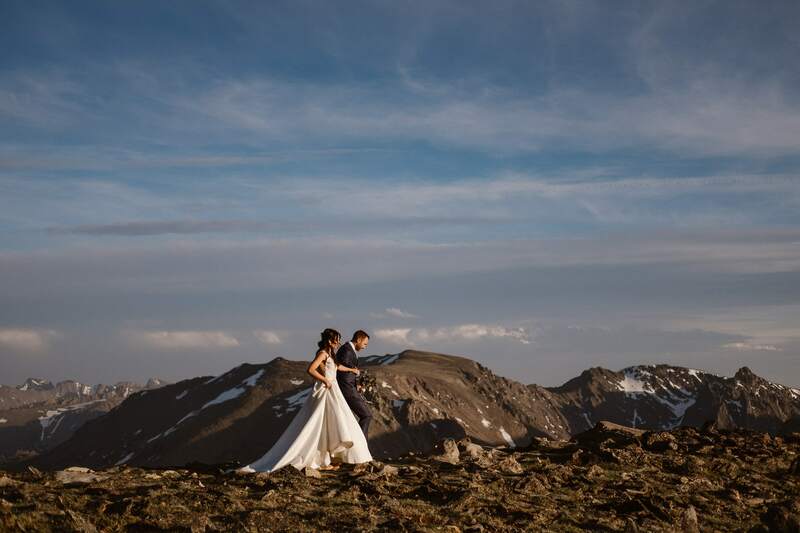 Check out Kimberly and Kevin’s elopement in August at an alpine lake, and Diana and Will’s post-wedding photos on Trail Ridge Road – both locations are only accessible for a few months every year. September is one of the best months to elope in Colorado, as it seems like everyone wants fall colors for their photos. The weather in September is pleasantly warm all over Colorado. There’s not as much chance for afternoon rain storms as in the earlier summer months. All the mountain roads are still open, so you have plenty gorgeous locations to choose from. The main negative of September elopements is that Colorado goes absolutely crazy on the weekends during fall colors. And it’s really, really hard to predict when the colors will be good. Last year I had elopements every weekend of September, and all of the couples wanted fall colors: only one of them got lucky. Some years the peak colors are the second week of September, some years it’s later. If you’re planning to elope in Colorado in September, I highly recommend that you don’t get too hung up on the fall colors, and that you pick a weekday! October is another interesting month here. There’s a high chance of snow, although it never sticks around for long at lower altitudes. By mid-October, you should think of it as a winter month, and rather be pleasantly surprised if you don’t get snow on your elopement day. Most of the smaller mountain pass roads close as soon as there’s snow, so you’re a bit more limited in choice of locations. But on the bright side, the mountains look amazing with a dusting of snow, and there are hardly any tourists around! 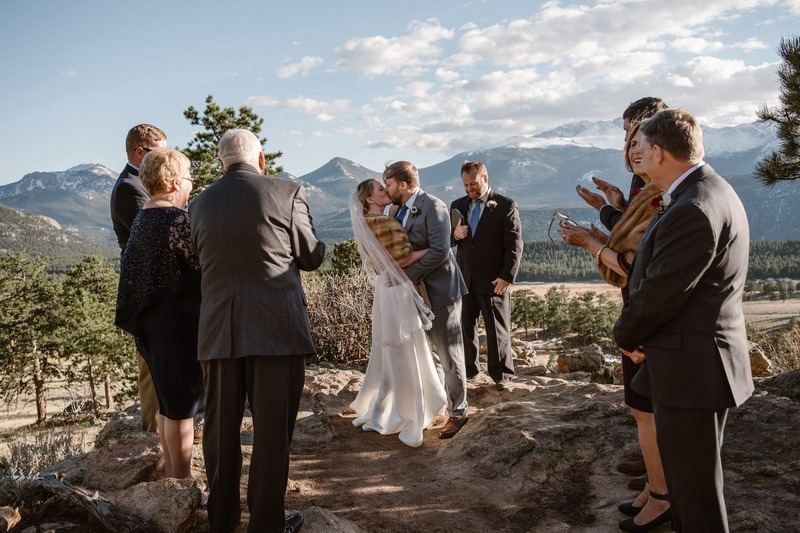 Juanita and Will’s elopement at 3M Curve in RMNP and Lauren and Josh’s elopement at 11,000ft were only one day apart, and really shows how different the weather can be between two locations. Avoid the weeks of Thanksgiving and Christmas if you’re looking for privacy, but otherwise these months are like any other winter months in Colorado. Snow is now sticking around at higher altitudes, while it’s melting as often as it falls in Boulder/Denver. If you want guaranteed winter and snow for your elopement, I don’t recommend November and December since there’s a good chance the landscapes will look brown and dead instead. BUT if you want to go for a longer hike without needing snowshoes, it’s perfect since the snow is not deep yet. 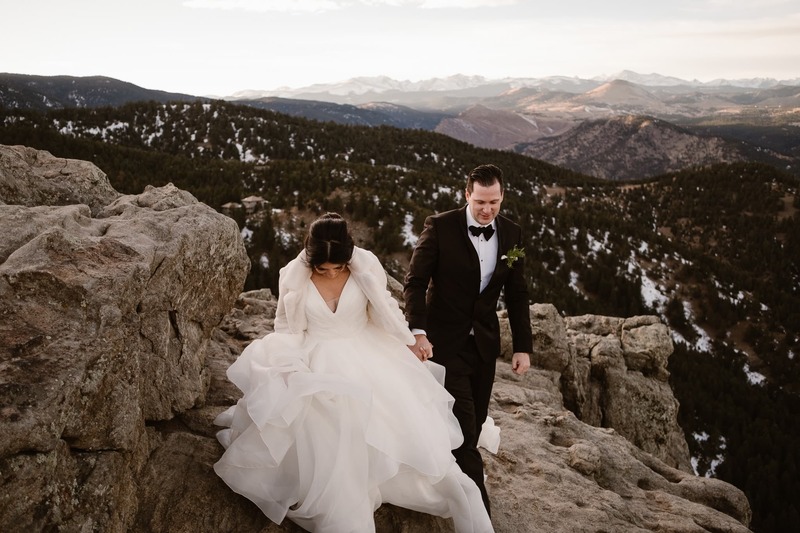 Karen and Sebastian’s elopement in Boulder on December 23 shows how warm winter can be in the foothills! And there you have it! 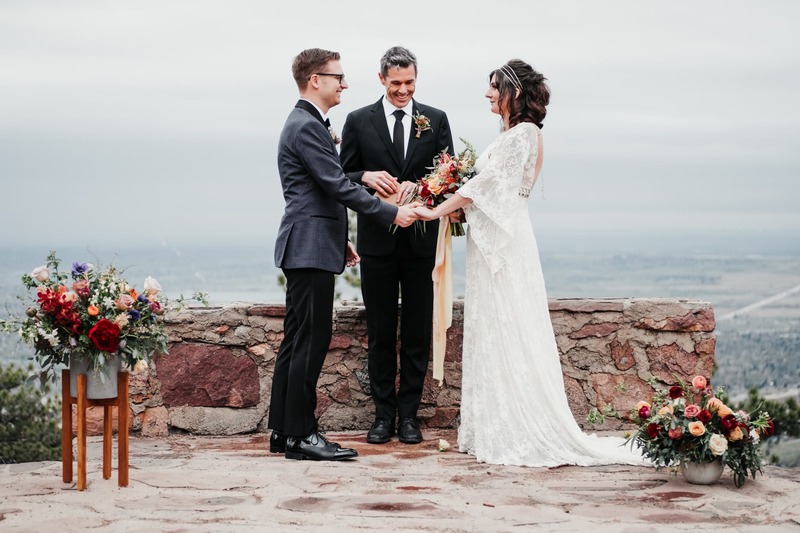 Hopefully this is enough to help you decide what’s the best month to elope in Colorado, but it’s so individual for every couple and what you’re looking for. If you want the most locations to choose from, wildflowers in the mountains, and zero chance of snow, go with July or August! If winter wonderland is more your style, January and February are perfect. But whichever month you choose, it’ll be epic. It’s Colorado.